Is it good to be bad? Or is it bad to be good? This snarky and fun retelling of the classic fairy tale 'Little Red Riding Hood and The Big Bad Wolf' will have you laughing out loud as you turn the pages. The stories are printed opposite one another so that when you finish reading one version of the story, you can turn the book upside down and read the other - each side has its own cover! This book is suitable for a YA audience, but will appeal to older readers as well. There are two sides to every story -- you deserve to read both! Something of an interesting premise, The Faery Taile Project apparently wants to retell fairy tales in something of a witty fashion, and while part of this idea is good, I don't know that this is pulled off all that well. The first book in this series retells the story of Little Red Riding Hood. Told in two sections as a flip book, one half of the book is Lobo's Tale, or the Wolf's story, by Christopher Kastensmidt, and he casts the Wolf as a redneck moron. That's the best that I can come up with. The Wolf blunders through the story, obviously trying to do anything to get Red to pay attention to him, as he is totally smitten with her. 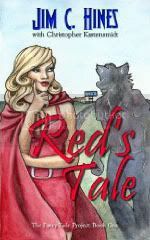 The flip side of the book is Red's Tale, by Jim C. Hines. This story is fairly well told (in this story, Red works for the fairy tale mafia and uses the wolf's idiocy to her advantage and we see how the events in Lobo's Tale relate back and forth with her story), but I'm thinking that Kastensmidt wrote his part first, and Hines then had to mold his story to fit, so I think if left to his own devices, Hines could have crafted something really witty with this story, but did the best he could with the story he had to work with. Not something that would lead me to read any more of the books in the "series." Just so you know I tagged you for the Your Blog Is Fabulous Award. Hope you enjoy it.